Hotspot Shield is a program that makes your connection more secure and allows pages to open restricted website in your country. Hotspot Shield creates a secure connection (VPN) between your computer and the Hotspot Shield servers, which are in the U.S. So, your connection will be American for all purposes, and you can access sites without any restriction. Hotspot Shield is very easy to use, the icon turns green when a secure connection is on and red when it is disabled. 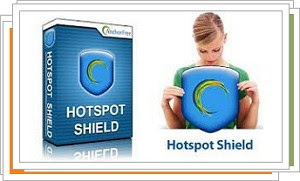 What one can criticize Hotspot Shield, along with the amount of advertising that leads are speed issues inherent in a VPN connection, but these are solved with the Elite version, which eliminates most limitations of Hotspot Shield Free.